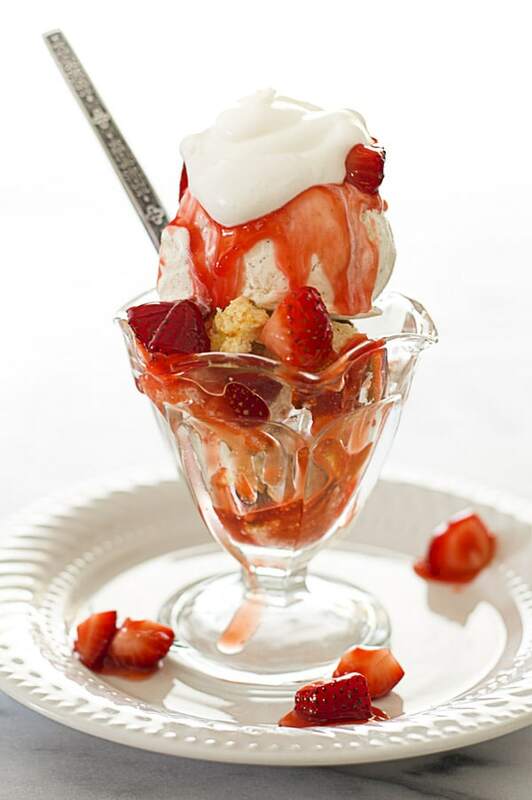 Strawberry shortcake sundaes for two, crumbly buttermilk shortcake with vanilla ice cream and an easy and delicious homemade strawberry ice cream topping. Add some whipped cream, grab a spoon, and dive right in. 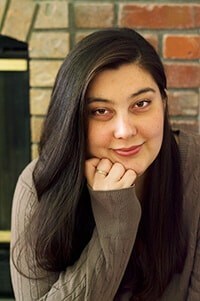 Oh hey, it’s a recipe post! It’s been a little while since we’ve had one of these. 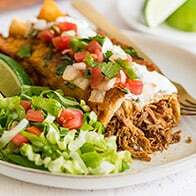 I’ve been MIA the last couple of weeks finishing up a big life-consuming project (more on that very soon), but I am now officially done and happy to be back, catching up with you lovely readers and making yummy food. I’ve missed you guys! How are you? What going on in your life? Is it sweltering where you are? Are you so ready for it to not be summer any longer? I’m great. My indoor cat ate an inexplicably indoor lizard last week (it was traumatizing). It’s very hot here. And I wish fall were now. 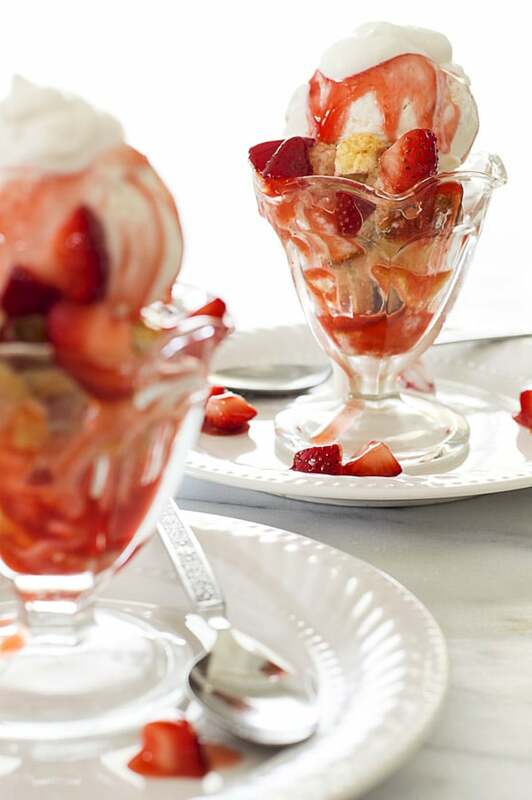 But if it must be summer, we may as well do what we can to enjoy it, so today I’m sharing my Strawberry Shortcake Sundaes for Two! 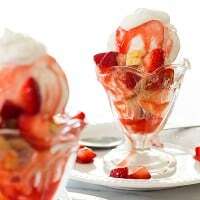 I’ve been making these strawberry shortcake sundaes for years, and usually I make them for a crowd, but I’ve really been enjoying posting small-batch desserts lately, so I shrunk this recipe down to serve two. And if you want, you can easily double or triple the recipe (see the recipe notes for doubling instructions). I’m a firm believer that the best sundaes are more than just ice cream and toppings. They need to be served over something. Earlier this summer, I posted my Caramel Apple Pie Sundaes which are served in a pie crust cup. These are served over cubed shortcake and they are amaaaaaazing. Since this is a recipe for two, we make just one cute and tasty buttermilk shortcake. It’s slightly sweet, and once cut up, serves as a perfect base for the rest of our sundae. Next up is a scoop of vanilla ice cream. Buy your favorite or make your own. It’s up to you. Then top it off with a fabulous (and easy) strawberry ice cream topping and a big dollop of whipped cream. 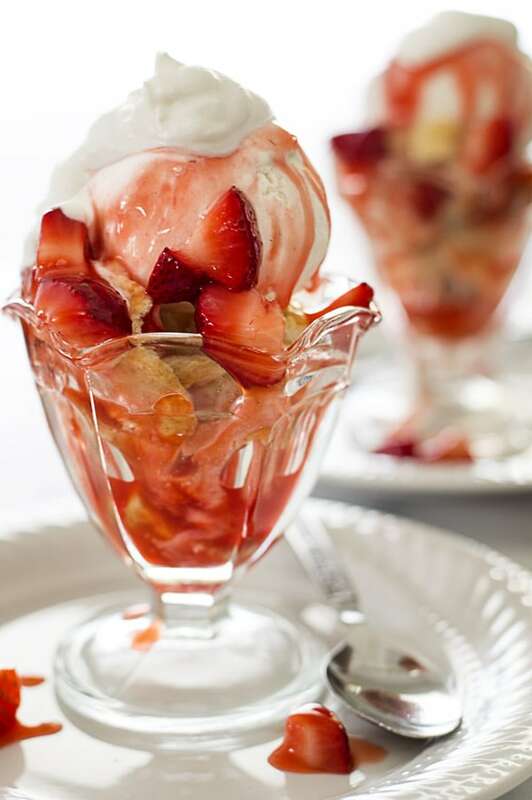 It makes for a fun, easy, and rather beautiful (if I do say so myself) strawberry shortcake sundae that will help you beat the heat in these dying days of summer. In a 1-quart pot, combine 2/3 cup (4oz) of the strawberries and water. 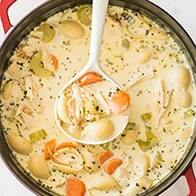 Bring to a simmer over medium-high heat. Turn heat down until the strawberries stay at a low simmer, and cook for 5 to 7 minutes, until strawberries are quite limp and begin to turn pale. In the last minute or two, squash the strawberries with a fork to get the last of the juice out of them. Remove from heat and use a fine-mesh strainer to drain the juice into a small bowl. Discard the limp strawberries and wipe out your saucepan. Return juice to the pan along with the sugar, lemon juice, and cornstarch and water mixture. Simmer for 2 to 4 minutes until thickened. Remove from heat and cool completely, 15 to 20 minutes. Preheat your oven to 400°F and line your baking sheet with parchment paper. 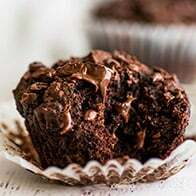 In a medium bowl, whisk together flour, sugar, baking powder, and salt. 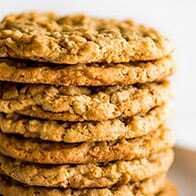 Use a biscuit cutter (or your fingers) to cut (or rub) in flour until no chunks larger than a pea remain. Add buttermilk and stir until a thick, sticky dough forms. Shape into a ball and place on your prepared baking sheet. In a small bowl, whisk together egg and milk and use a pastry brush to brush a light layer of egg wash over the entire surface. Bake for 13 to 15 minutes, until golden. Allow to cool on the baking sheet. Once cool, use a serrated knife to cut the shortcake into 1-inch cubes (cubes will be rough and crumbly). Stir the remaining strawberries into the cooled glaze. Evenly divide the shortcake cubes into two bowls. Top shortcake with a scoop of vanilla ice cream, half of the strawberry topping, and whipped cream if desired. Strawberry ice cream topping can be made up to 2 days in advance. Store in an air-tight container in the refrigerator. To double or triple the recipe, simmer strawberry juice/lemon juice/sugar/cornstarch mixture for 2 to 5 minutes longer, and shape shortcake dough into 2 or 3 balls before baking (don't try to make 1 giant doubled shortcake). For buttermilk substitutions, freezer instructions, and recipe ideas for using up leftover buttermilk, check out this post.